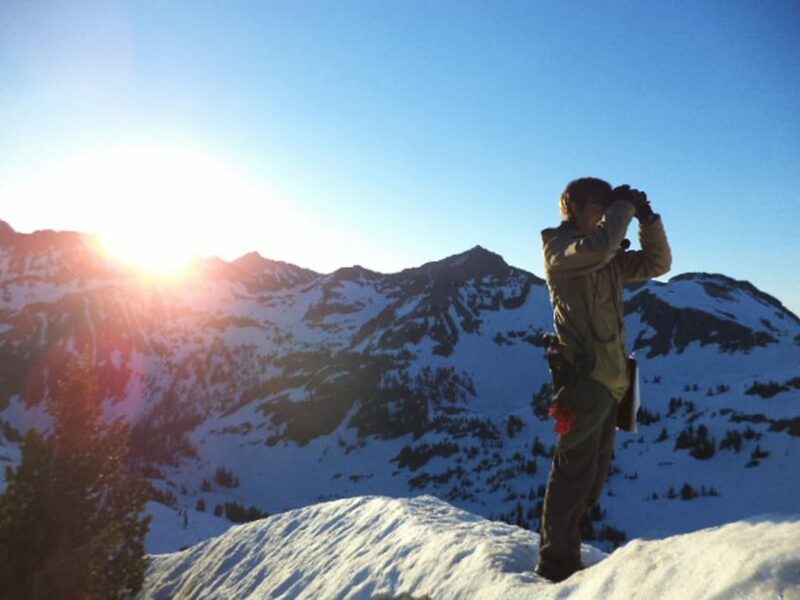 The author surveys a snowy slope on the west side of the Tetons. This summer marks my third year counting birds throughout Wyoming as a field technician with Bird Conservancy of the Rockies. It’s difficult to describe this experience without launching into a series of grand tales. Being an Integrated Monitoring in Bird Conservation Regions (IMBCR) field technician is a ridiculously awesome experience that sometimes feels like a 3-month vacation. That said, the job is a serious scientific endeavor that includes a rare and diverse array of challenges and obstacles. As a key link between conservation programs, funding agencies, private landowners, and the birds we are trying to protect, the work requires a serious commitment. 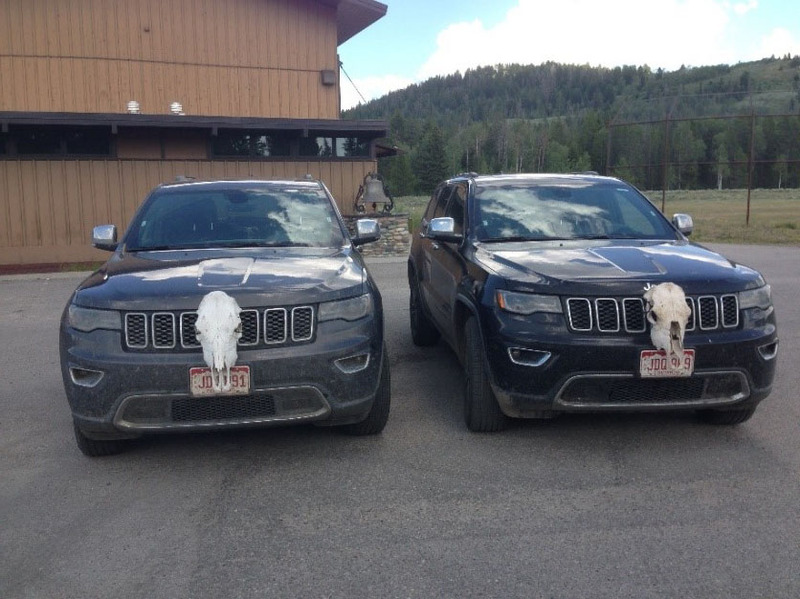 Properly outfitted field vehicles; Moran Junction, WY. As a field technician, you essentially live in a jeep, driving between survey locations and counting birds. The locations are randomly selected GPS coordinates, and are often remote. 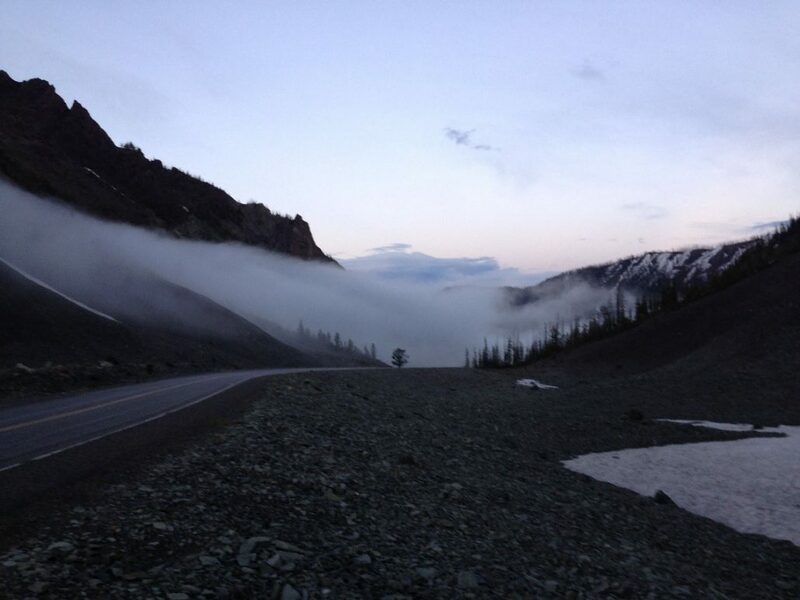 Driving and hiking into the wilderness to reach the designated spot inevitably leads to some memorable experiences. We hope to see many interesting birds, from scarce Mountain Plovers, McCown’s Longspurs, and Pinyon Jays to the famous Greater Sage-Grouse, and even tiny Calliope Hummingbirds. These are just five of the 250+ species you could see in Wyoming. Other wildlife encounters are assured as well. It was during my first summer in the field that I saw my first moose in the wild, loping across a meadow with its calf not more than 50 yards away. I’ve since lost count of how many moose I’ve seen. Last year, I spotted six grizzly bears and one black bear that was foraging on a sagebrush hillside with a stem of grass sticking out of its mouth like a wheat farmer. Challenges can range from minor logistical annoyances to situations requiring tremendous perserverance. I vividly recall trying to count birds for six minutes while knee-deep in frigid snow-melt, accompanied by every mosquito in Yellowstone. Then there was the time when my partner insisted on eating tins of smoked oysters and sardines for dinner while we camped in grizzly country. Once, a pack of helpful (and giant) sheep dogs followed me throughout a ranch survey. On paper, these instances make for amusing stories, but at the time they can range from inconvenient to downright frightening! Just another hazard while visiting randomly-selected remote locations. A technician always needs to be aware of where they are, and whose land they’re on. 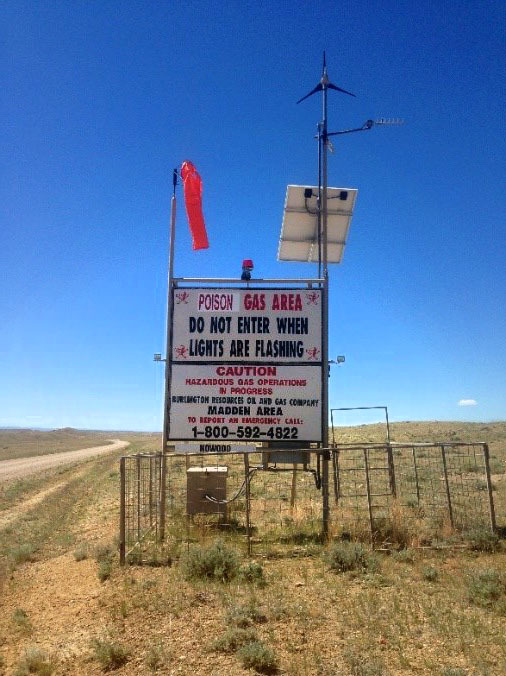 Wyoming has very strict trespassing laws, and Bird Conservancy strives to build positive relationships with landowners. We are extra careful to mind where we go. Consequently, techs probably spend nearly as much time plotting legal routes in and out of each survey location as they do counting birds. Images from field season adventures: grizzly bear tracks, a questionable Wyoming “road” and a raging river. Technicians are trained to deal with common obstacles, which include everything from wildlife to flat tires and river crossings. My favorite memory from the field comes from a mountaintop, way back on the west side of the Tetons. After backpacking up a long valley, my partner and I expected to climb up and over a saddle and down into a bowl where our survey was located. It wasn’t that simple. 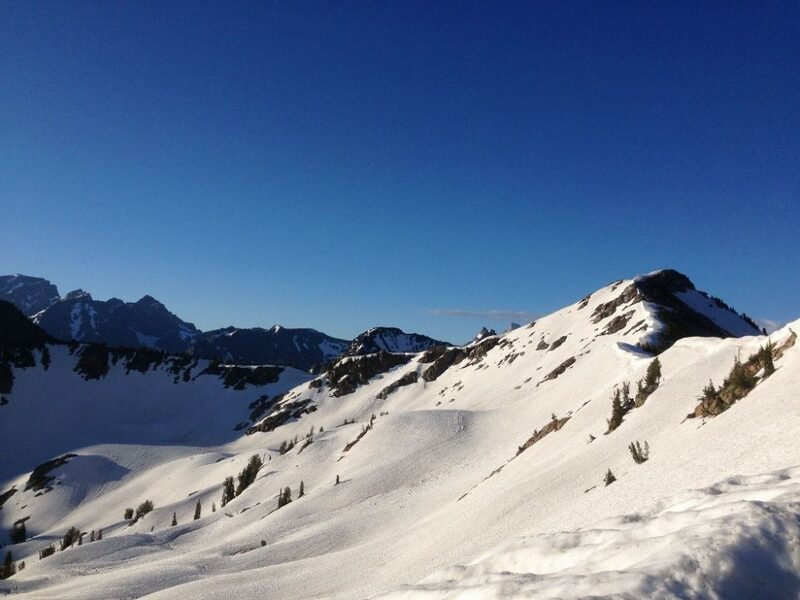 In actuality, we climbed the mountain and were met by a thousand-foot drop into a sheer bowl of impassable ice. We meandered around the ridgeline for several hours, looking for a way down into that basin, ultimately ending up on a knife-edge ridge. Here, we finally acknowledged that the survey location was inaccessible. We rested before heading back down, and there, on a snowy precipice at 10,000 ft, surrounded by rocks and ice, a tiny Broad-tailed Hummingbird flew in, buzzed around us, and then flew off down the basin. A cursory check of the habits of Broad-tailed Hummingbirds reveals this is not an unusual occurrence. Still, the image of that little green jewel hovering in such a majestic landscape is forever burned into my mind. This photo was taken along the ridge where we were visited by the Broad-tailed Hummingbird. Of course, while we have a lot of fun, the work we’re doing in the field is important and valuable. Techs share a professional, passionate devotion to collecting consistent and objective data. We are the ones gathering information which may guide land management decisions, so we have to be sure that our data paint an accurate picture. On a personal level, I have matured enormously over these last two seasons and learned a tremendous amount. I’ve fledged from a kid fresh out of college with a little bit of ambition, but almost zero direction or perspective, into something resembling a real biologist. Learning about the science of conservation, meeting all sorts of interesting and brilliant people, and experiencing what goes into the work has greatly broadened my perspective and set a course for my career in conservation. Rugged but magical landscapes await our summer field technicians as they set out in search of birds. We look forward to hearing more of their stories!